Killers Sentenced In Hacking Death Of British Soldier : The Two-Way Fusilier Lee Rigby was attacked in London. The killers said they were avenging the deaths of Muslims in Iraq and Afghanistan. One killer will die in prison. The other will be there at least 45 years. One of the two men who hacked to death a British soldier on a London street in May 2013 was sentenced Wednesday to spend the rest of his life in prison. The other was given a minimum term of 45 years. 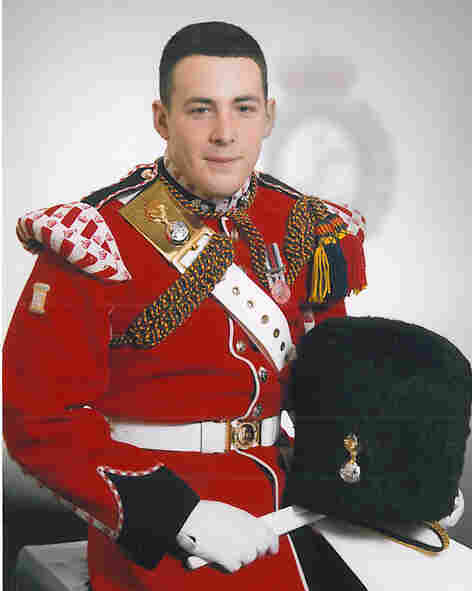 The killing of 25-year-old Fusilier Lee Rigby, who was a member of the British army's Corps of Drums, shocked the U.K. It was carried out in broad daylight and the attackers were seen and heard on witnesses' videos claiming that they were avenging the deaths of Muslims killed during the wars in Afghanistan and Iraq. The men first struck Rigby with a car, then went at him with knives and a meat cleaver. "Drummer" Rigby had served in Afghanistan at one point, but his killers did not know that. They attacked Rigby as he walked near an army barracks. Authorities praised the actions of the witnesses, who at one point tried to shield the fatally wounded Rigby from the attackers. On Wednesday, 29-year-old Michael Adebolajo, who the judge said was the leader of the "joint enterprise," was given a "whole-life term," the BBC writes. That means he'll be in prison until he dies. Michael Adebowale, 22, was given the sentence with the 45-year minimum. "The pair were absent during sentencing after a scuffle in the dock. "As Mr Justice Sweeney began to sentence the men they started shouting and scuffling with court security guards. They had to be forced to the ground and were removed from court." "Nine security guards flanking them in the dock grappled with the convicted terrorists," the Guardian adds. "Adebolajo was pinned to the ground before being carried out head first. Adebowale was dragged out. The scuffle lasted over a minute and was so violent that protective screens over the dock rocked. The fighting was yards from Rigby's family, some of whom were so upset they were left crying." Before the men were sentenced, a statement from Rigby's widow Rebecca Rigby was read. She said, according to the Guardian, that "of all the feelings I have, the one thing that overrides everything is that I know my son will grow up and see images of his dad that no son should ever have to endure, and there is nothing I can do to change this." "Lee will never be forgotten," Rebecca Rigby added. "We will always love him and miss him every day." "Goodnight mum, I hope you had a fantastic day today because you are the most fantastic and one-in-a million mum that anyone could ever wish for. Thank you for supporting me all these years, you're not just my mum you're my best friend. So goodnight, love you loads."